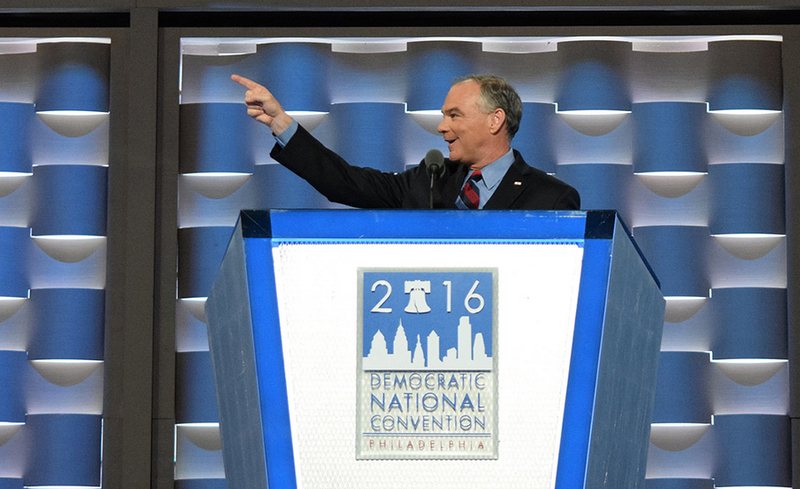 The divisive nature of the American two-party political system is a study in contrast that extends to how the set designs used by the Democrats and Republicans at their respective conventions. On one side, you have the Republicans’ over the top and larger than life design that evokes feelings of power, while the Democrats went for a smaller, less forceful presence. 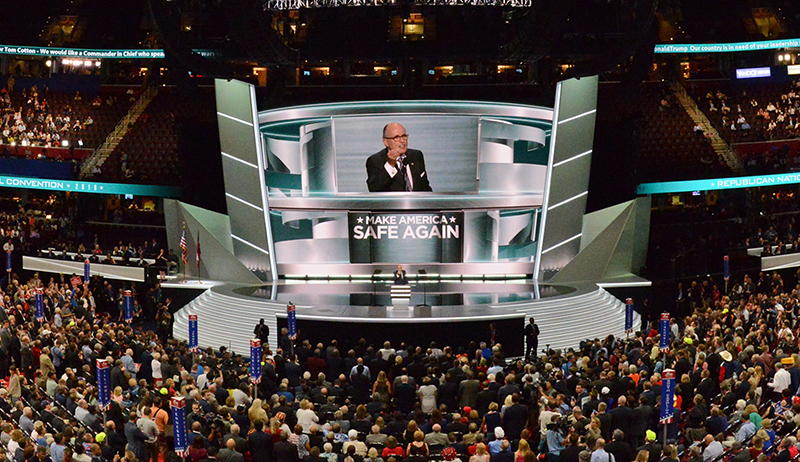 In Cleveland, the Republican National Convention erected a large set in the Quicken Loans Arena that featured sharp, strong angles that evoked feelings of jutting rocks or wings coated in a soft metallic surface that could be lit in a variety of ways. The large video screen over the main platform area, which was coated in a shiny black finish, gave the upper portion of the design a strong sense of visual weight. When viewed as a whole, the visual connections to everything from crowns to eagles to space age aircraft and Spartan (or Iron Man?) helmets could be found — all of which created the image of power, strength and perhaps even fear — a theme that many pundits pointed out was a prominent message in the Republican’s speeches. That bold, in your face design philosophy also extended to the design of the graphics and animations fed to the various on-stage screens. 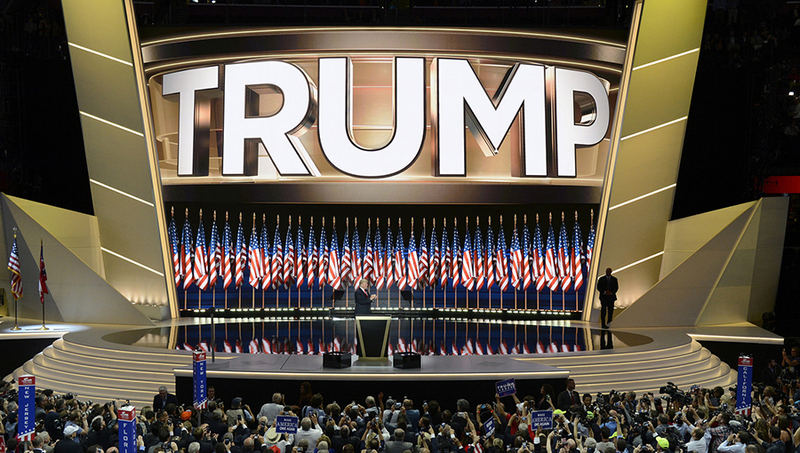 Perhaps the most obvious example of this was the large “Trump” that was, quite literally, jammed into the screen and rendered in thick, bold metallic 3D letters that seemed to bulge off the screen. Tight letter spacing made the word seem even larger — perhaps a not-so-subtle nod to Trump’s larger than life character. The Cleveland design also moved the wings of tiered seating for party officials out of the spotlight as essentially independent of the stage design, perhaps a way to keep the focus on the stage and its personalities. 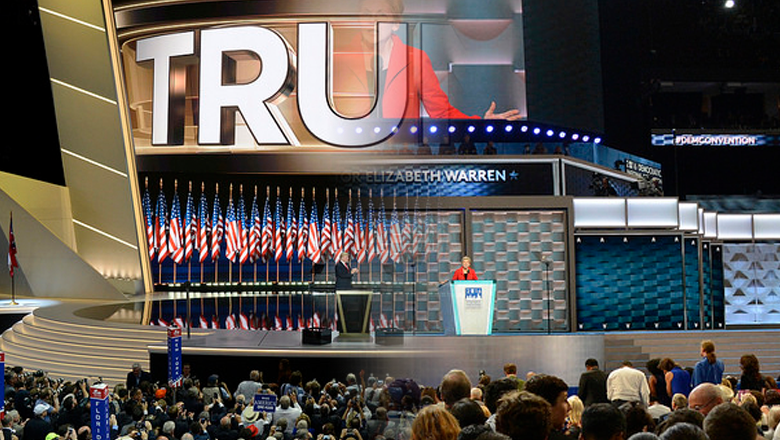 In Philadelphia, however, the Democratic National Convention opted for a much more simplistic approach inside the Wells Fargo Center. 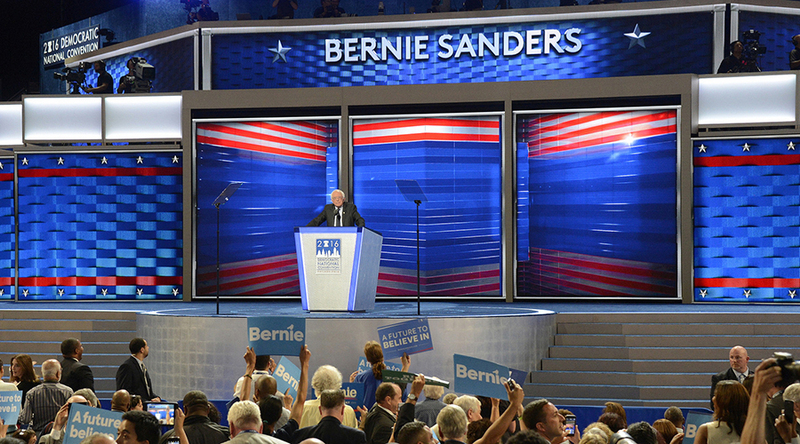 This set design, while essentially the same layout as the Republicans’, relied less on strong structural elements and instead placed the focus on the multiple video and textural panels used to create the set’s main backgrounds. These panels were strategically arranged to create a sense of both depth and dimension, including through the use of three movable central panels. The stage, meanwhile, was covered in a blue carpet that also included a ring of stars around the dais. A lectern, which could be raised and lowered, was a streamlined keystone shape, a homage to the host state’s nickname. The imagery used in those screens, meanwhile, was an eclectic mix of what perhaps could be, rather oxymoronically, as flatter textures — including horizontal “woven” bands with gentle lighting and shadow effects to keep the look from being overly flat while adding texture. Where the Republicans’ typography was bold and large, the Democrats opted for a slightly softer look that used lighter strokes and more generous spacing between letters and less 3D effects, making the designs feel more approachable. 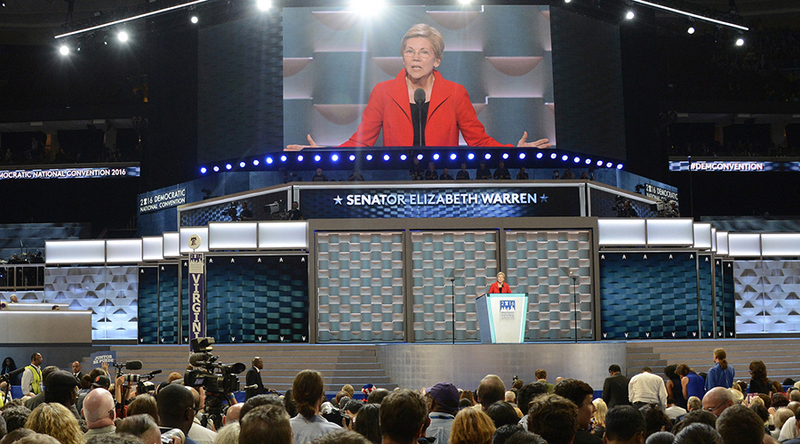 The Democrats also took a different approach to the use of imagery in the screens — whereas the Republicans created more thematic, stylized looks, the DNC designs favored photography that complemented the on-stage messages. 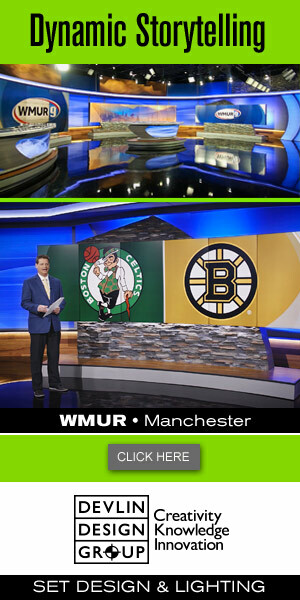 To their credit, most of the major networks quickly spotted this and took full advantage of mixing in wider shots that showed both the presenter and supplementary photography at the same time. The Philadelphia design also made what appeared to be a concerted effort to be more of an “in the round” feel — with seating for party officials visibly flanking both sides and tightly integrated into the design of the stage. The set also included a mezzanine levels above and behind the main speaking platform that was used for live video camera feeds and press photographs.